As part of the Unlocking Our Sound Heritage (UOSH) project we have been training volunteers in how to archive and use sound recordings. One of the projects we are working on is creating sound clips that can be used in reminiscence work, and one of the topics we are looking at is holidays. The way we take our holidays, and the amount of holiday time we have, has changed considerably in recent years. However, one destination remains a constant in the life of many Leicester people and that is Skegness. We are compiling a number of sound clips that recall the heyday of trips to the East Coast, and volunteer Jihong Shi has started the ball rolling with these clips taken from a 1980s compilation cassette from the Leicester Oral History Archive. 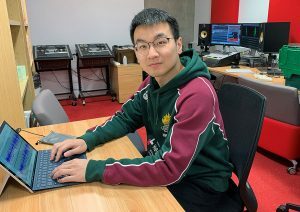 Jihong using Audacity to create the clips below. The process involves identifying suitable clips from a typed summary of the whole compilation. Then, the recording has to be listened to and the clip identified. This is easier said than done as the summaries have no timings and vary in their quality and detail. Using Audacity software, the clip is edited so coughs and splutters are removed, the volume is adjusted, and the tape hiss is removed. Track 1 – F Birch, EMOHA Ref: 733, LO/101/052 – bed and breakfast. In days gone by the landlady took your food and cooked it for you. Track 2 – Phyllis Calow, EMOHA Ref: 730, LO/098/049 – cycling to Skegness on a tandem and feeling rich with £14 for the week. Track 3 – Elizabeth Stretton, EMOHA Ref: 728, LO/096/047 hiring a taxi to go on holiday and failing to get up steep hills. The skill of editing sound is to be able to identify the main points of the story and remove any unnecessary information while still keeping the sense of the story and the way it was told. The aim is to produce short clips that most listeners can identify with and that will help to stir memories of past holidays.